Ask fellow campers about "Yogi Bear's Jellystone Park Camp-Resort at Dogwood Valley" and nearby attractions. We stayed here the third week of September. Because we were staying for 8 days we got 1 night free. The park is fantastic whether you have children or are seniors like us. We had a beautiful sight over looking the lake and the beach. The owners and staff are very attentive, and friendly. We arrived on a Sunday, and the park was quiet and very few daily spot were full, mostly seasonal trailer, and their owners were gone home for the week. They told us that come the weekend it would fill up, and it sure did. The grounds are well kept as we observed the maintenance crews during the weeks taking care of every thing. Every site has a camp fire ring . The camp store ( called the Ranger Station) not only has everything you need it also has a great porch with tables and chairs and rockers where you can sit and watch big screen TV while you enjoy your ice cream you just purchased. You can sit on the porch and get free Wi-Fi. The owners are very friendly and when we were checking out my husband was having a great conversation with the husband and I was having a conversation with the wife, we left an hour later than we planned. I don't think you will find a better place in the area. We had a full hook-up site which included cable. We had 60 available stations and the picture on out TV was crystal clear. Make sure you have full direction. If you are coming in during the evening hours like we were, you can miss Township Road 99. This is a small two lane road and the only lights are your headlights. We camped at Yogi Bear's Jellystone Park Camp-Resort at Dogwood Valley in a Travel Trailer. If you are going to Mid-Ohio Race Course this would be the place to camp. It is only 25 minutes away. This park is very well run. The owners are active and they have continuous activities for the kids. There is a clean pool and 2 well run water slides. The bathrooms near our loop were new and always spotless. There were no separate activity fees, kayak and paddle boats are included in your stay, and there is a honey wagon that will come and pump you out. The lake is Beautiful and there is a Sandy swimming beach. this is truly a great place to unwind and we will be back. We camped at Yogi Bear's Jellystone Park Camp-Resort at Dogwood Valley in a Travel Trailer. Kroger and discount drug mart are only 3 miles upbthe road. This is a nice campground but the sites were more dirt than grass and the overnight rate was a little expensive with the extra kids. The water slide was nice but we didn't like the swimming pool set up. They had fun activities for the kids, nice store and swimming pond. We didn't hike but the woods looked nice. We camped at Yogi Bear's Jellystone Park Camp-Resort at Dogwood Valley in a Motorhome. This was a nice campground, comfortably remote (no highway noise), quiet, and very family friendly. The pond is clean and enjoyable to swim in and we love that boats (paddle, canoes and row boats) are included at no charge. The pools are nice too. There are many seasonal sites and most are in good condition. The park is very hilly but that's good. The shop is clean and well stocked and the owners are very nice. The only negative is that the roads are aged and the gravel on the sites is dispersed to the point that it's difficult to differentiate between grass and gravel areas. This is a minor issue and we will definitely return! We camped at Yogi Bear's Jellystone Park Camp-Resort at Dogwood Valley in a Travel Trailer. Very nice park for families in travel trailer or small fifth wheel but would definitely discourage big rigs. Arrived at dusk due to inadequate signage. No interstates signs yet but were told they have been ordered. We were led to our space by a staff member via golf cart over a very narrow ridge road around the edge of a nice pond and then up a very steep hill. Another guy showed up in a golf cart but was no help at all. Just the opposite; shining lights in our faces and darting all around as we were trying to park. There are many permanent travel trailer homes here but they appear to be well kept. They are making more camping spots in this beautifully wooded park but have several low cut tree stumps that can easily be missed in mirrors when pulling or backing that could cause significant damage to vehicles. Overall, nice, very quiet place a few miles from town with friendly, helpful staff. Great camping store with necessities and souvenirs. 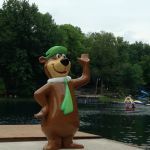 We camped at Yogi Bear's Jellystone Park Camp-Resort at Dogwood Valley in a Motorhome. This a nice park. Restrooms were very clean and there seemed to be a lot of family friendly activities available. It was also quite quiet after 10:00 pm. The cable television worked well. I would just mention to anyone with a long trailer, to be aware that there are some very tight turns. There are also several big dips in the roadway and a longer trailer is going to drag. The park is rated as "Big Rig Friendly" and I would have to disagree with that. We were given what was described as a "premium pull-through" and we had about 5 feet from our trailer to the road. We could not put the awning out or use the fire ring. We were disappointed; especially after paying $82 per night. We camped at Yogi Bear's Jellystone Park Camp-Resort at Dogwood Valley in a Fifth Wheel. This is an excellent resort. The store, pools, lake, restrooms, and bike/hike trails are amazing!! There is a little creek where my kids liked to explore. They even have a workout facility, but we didn't use it; there was too much to do. They had a movie night in the shelter house and the golf cart parade was nice to watch. This is very family friendly. We had a small issue and it was immediately taken care of by the kind and helpful staff. Good cell phone reception, too. We camped at Yogi Bear's Jellystone Park Camp-Resort at Dogwood Valley in a Motorhome. The new owners have put many, many thousands of dollars into upgrades and refurbishing and it really shows. They aren't finished yet. The grounds are lush and beautiful, woodsy, and lots of green grass. Staff was wonderful and fun to work with. One of the nicest family parks we have ever camped in. Great layout for family camping without feeling jammed in and nose to nose. Fun things for kids to do. Prices are very reasonable for the costs to provide the amenities and keep the park spotless. We highly recommend this park. We camped at Yogi Bear's Jellystone Park Camp-Resort at Dogwood Valley in a Fifth Wheel. We had a great time! Plenty of activities scheduled while we were here. Restrooms are clean, staff is friendly and the park is beautiful. We decided to try this park out before the big holiday weekend and we were more than impressed. We will definitely be back. We camped at Yogi Bear's Jellystone Park Camp-Resort at Dogwood Valley in a Motorhome. We wanted to really like this place. The reviews were ok, the amenities looked good. The nickel-and-diming they did, among other things, was what soured our experience. The roads/paths in the facility are horrible, partially paved, mostly pot-holes. They are narrow and some turns would be near impossible for a large rig. There seems to be some sites that were better than others. Our site was very unlevel and mostly gravel. I couldn't drive a stake to put up the awning, had to tie to trees. Be very prepared to spend way more money that you anticipate. Even the little crafts, that our kids participated and their participation proved to be everyone else's entertainment for the evening, cost money to make the craft. If someone comes to visit, it will be very pricey, unless you are a seasonal camper here. They have a large water slide. The kids loved it but again, cost was additional for a non-seasonal camper. Be very careful if you have young kids doing the slide, the supervision at the bottom leaves a lot to be desired. They used to be KOA listed; do not know if KOA unlisted them or it was at the direction of the new owners. Suggest you save your money (and your sanity) and find another campground. We camped at Yogi Bear's Jellystone Park Camp-Resort at Dogwood Valley in a Tent Trailer. If you're a seasonal here, you'll love it. If you stop by for a few nights, you won't like it. Narrow roads filled with pot holes. Sites are gravel and extremely unlevel. We paid $43 per night for a full hookup and it was right across from the shower house and a trash site. People walking through our campsite day and night going to the shower house. Asked to be moved and told that was the only site available. We are here for the Mid-Ohio race and everything else is full. Very poor map of campground took us 30 minutes just to find our site. Took us over 30 minutes to check in. Save your money and go somewhere else. We camped at Yogi Bear's Jellystone Park Camp-Resort at Dogwood Valley in a Travel Trailer. We stayed here because it is fairly close to Craig Smith RV in Galion, where we took our RV for repairs. Most of the people are permanents, but it is okay for an over-night. The bathrooms and showers are clean and well maintained, and the staff is very friendly. The roads in the park are very narrow and winding, and there is very little room for error when going past the lake, so be careful. We camped at Yogi Bear's Jellystone Park Camp-Resort at Dogwood Valley in a Motorhome. This is a great camp ground for smaller RV's. Great things for kids and fishing for everyone BUT the roads are very narrow and there are some very tight turns. This is not a big rig friendly camp ground. We camped at Yogi Bear's Jellystone Park Camp-Resort at Dogwood Valley in a Fifth Wheel. We camped here because the place we wanted to go was full. It turned into a good problem because this was a great place to visit. The staff was fantastic helping us out on such a short notice. The restrooms and showers were first rate and very clean. The only drawback was that this place is mostly filled with year round people that all seem to have golf carts. They fill the gravel roads at most times during the day and on bikes we were always dodging them. Other than that, this place is great. We camped at Yogi Bear's Jellystone Park Camp-Resort at Dogwood Valley in a Truck Camper. It is a beautiful campground; very shady & clean. The new shower house is exceptional, equipped with sliding doors and private changing area. We camped near north shower house and did not notice any sewer smell. There are lots of activities for adults and kids. The roads are a bit hilly; we rented a golf cart for the weekend and really enjoyed it. Cable TV was in process of being installed to entire campground. There are very friendly owners & staff. Seasonal campers were also friendly towards us. The rates vary according to services needed and site location. We camped at Yogi Bear's Jellystone Park Camp-Resort at Dogwood Valley in a Fifth Wheel. Are you affiliated with Yogi Bear's Jellystone Park Camp-Resort at Dogwood Valley ?